If I escape here tomorrow, would you still remember TomaTea? Well, maybe that's not the way Lynyrd Skynyrd would have played it but we here at JIG love our escape games and have no plans to travel on anytime soon. When you open up and start exploring TomaTea's latest creation, Escape Bird, you'll be glad to see nothing has changed about the characteristic TomaTea style that you love so much. Once again, you're locked inside a welcoming, well-composed room that invites you to explore its numerous chests and tasteful decor as you contemplate clues that are cleverly conveyed. A cursor that glows over hot spots and gentle reminders when a puzzle isn't ready to be solved continues TomaTea's venue as affable host while re-appearing is the use of picture tiles (this time with a slightly trickier trick) and color based puzzles (unfortunately for those less visually acute). Yet, as always, time spent here feels like a cup of tea and biscuits: only a touch of logic, lateral thinking and, perhaps, pen and notepad are all that are needed to be as free as a bird. 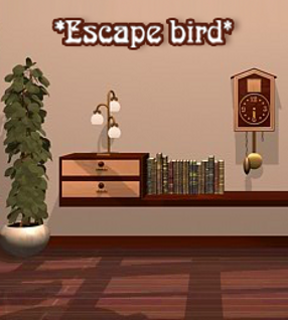 Escape Bird Walkthrough now available! Have you looked under the lamp (on the wall with the mirror)? after flipping the bottom right piece and fastening it back in place, set the circles to match the left picture, i.e. yellow circle on top. use the arrows to align the slices to form a picture. The top of the picture will be the apex of the clock. press the buttons that correspond to dark brown leaves. 24563; hit the notes counting from the left. Pick up PICTURE SLAT (1/6) from the table. The board on the right has a 4x4 grid on it. The middle board has a row of 6 up arrows on the top and 5 down arrows on the bottom (1 is missing). Its box reads "TIME." The board on the left has a wheel of four colors, starting from the top and going clockwise: yellow, red, blue, and green. Pick up PICTURE SLAT (2/6). A series of four numbers: each seems to be arranged in a pattern. Back up and look at the top drawer. You're not ready to solve it but note that it has two buttons, left and right, and that it's labeled: "HERBARIUM." Then note that the bottom drawer seems to require a 4-digit number code. Yet, for some reason, you're also not ready to solve it. It has four tiles on top; you can turn each but you can't seem to match the board on the wall. The bottom right tile has a screw in it. Lastly, examine the cupboard in the left corner to see key is needed there. It needs a weight and a minute hand. You still have no clue how to solve the bottom drawer, but you can see that you'll need a sequence of four leaves to do it. On the other hand, the top drawer--with a 4-letter code--is ready to be solved! Use the clue from the yellow paper (found under the lamp on top of the other drawers). ...giving you the word you need to spell on the drawer. There is a pattern to the letters on the cover. There is a specific leaf (brown ivy) on the cover. Pages I, II, III, and V have different leaf types on display. Page III also has a pattern of different colors but same shape as the leaf on the cover. Page IV has a series of numbers that grow in size. Back up. You're now ready to open the top drawer in the opposite corner of the room as well as the 4x4 grid on the bulletin board. Turn around until you're facing the door and wall of bulletin boards things. Examine the board on the far right. If you click a square on the 4x4 grid, it will be highlighted (click again to unselect). In the HERBARIUM BOOK is another pattern of 4x4. A series of letters that seem to form shapes. Now you can open another drawer, the one with a 4-digit number, as well as still having the Herbarium drawer to still do. Turn left from the bulletin boards wall to face the mirror wall. Zoom in on the drawers on the right side of the counter. Use the clue you found under the 4x4 grid plus the word under the middle bulletin board to determine the code. Examining the top drawer next to the tea set, you'll see it has two large buttons, left and right. The word "HERBARIUM" above the buttons matches the title of the book. Sometimes there are two letters, like the buttons, sometimes one. If there are two letters, then you'll push the LEFT then the RIGHT buttons. BUt if there is on letter, then you'll push only the left button. Example: H E = Left Right. Push the left/right buttons in the correct sequence then click the smaller button below them to open the drawer. Back up. Now you can solve the color circles box. Examine the box under the mirror. Use the SCREWDRIVER to remove the screw from the bottom right square. While in your inventory detail screen, click the colors square to flip it over. Now the colors are going the opposite direction, giving you the option to form new patterns on the box. Replace the flipped COLORS SQUARE onto the box. THEN, put the SCREW back in, using the SCREWDRIVER to secure it. When you have the colors correct, the box will pop open (colorblind players: once you get the yellow circle on top, the other pieces easily fall into place). Using your SCREWDRIVER, take back the SCREW again (it may come in handy later). Put the clue away and back up. Now you're ready to open the bottom drawer over by the tall plant. Turn around until you're facing the wall by the clock and tall plant. The card with the roman numerals give you the order and the pages to look at. The pictures inside the book indicate which shape to use. Note: descriptions are not exact, just meant to help. I'm not an arborist! Use the KEY (from the 4-digit number drawer) to unlock the cupboard door. and the last PICTURE SLAT (6/6). Replace the missing XYLOPHONE KEY. Then put in the SCREW*, using the screwdriver to secure it. *If you haven't done so already, go get the SCREW from off the box under the mirror. 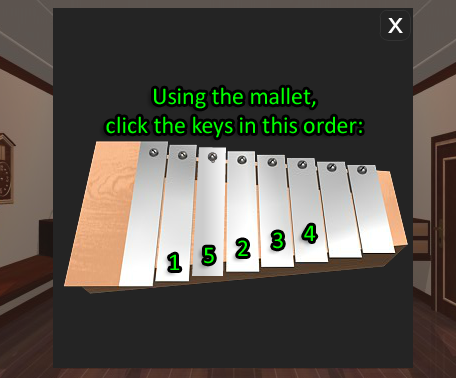 Use the clue from page IV of the herbarium book to know which keys to strike with the mallet. It's easy to get thrown off by this one. The shape of the writing indicates that these numbers refer to the xylophone. There seems to be no other connection regarding size other than to try to throw you off. Just like in the clue, number the keys from left to right. Ignoring the size of the writing, strike the keys as indicated. get the DOWN ARROW BUTTON. Replace the missing DOWN ARROW BUTTON. Then put the 6 PICTURE SLATS onto the board. Using the up and down arrows, adjust the picture slats until the image is perfectly aligned. 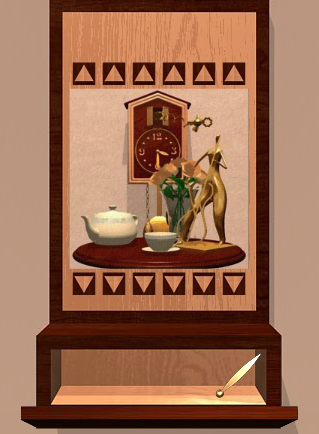 When the image is correct, the shelf/box will open and you can get the MINUTE HAND of the clock. Then put the MINUTE HAND back on the clock face. Click each of the clock hands until its at the correct time, releasing the cuckoo bird. But what is the correct time? You saw it recently. Take the EXIT KEY from the cuckoo's mouth. Turn around to face the door, use the key and you're as free as a bird! That was a nice and quick escape. I love those ones. xylophone, which I'm assuming needs some sort of stick to play it? the other clock hand, which is the other assumption I'm making. Does the clock unlock the xylophone or the other way 'round? 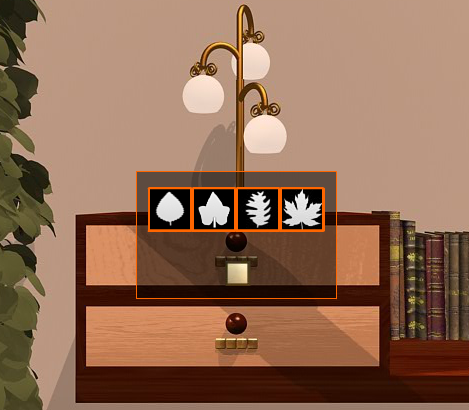 Stuck on the left/right buttons with the "herbarium" clue. Hint, anyone? Jeez, having a *bad* day. Stuck on the first puzzle... in that, I can't find it! >. I need help with the 4x4 grid on the right board (of the 3 boards on the screen to the left of the big windows). Is it related to the 2 colored leaves on page III in the book? Finally! After spending 5 minutes sitting in the room doing nothing I found which puzzle was first. Didn't see that hidden item. Try taking a look at the brown leaves in the book. I think it's page 3 has a mix of green, yellow and brown leaves? The brown ones are they key! used the screwdriver on the box with the rotating colored semicircles, and gotten the colors to match up. I assumed this would help me solve the wall puzzle with the four colored circles, but I'm still stuck. I think you need to replace the screw, screwing it back in, now that you've picked up and turned that piece. Then turn the colors to match the board on the wall. That will cause two things to happen. solved the puzzle with the four circle colors; like was said above, it was a bit confusing as to screwing back on the color square. I need a hint for the left/right puzzle please. 1. Why "Escape Bird"? There's no avian critter to be found anywhere in the game. Time, yes; leaves, yes; but no feathered friends. seems to hint that we are to progress from smaller to larger, i.e. count from the right. However, you actually need to count from the left. You have to release the cuckoo (let it escape/be free!) before you can then also escape and be free! Very nice escape games with extremely anti-climactic endings. And music that I have to mute. But you know what? Who cares if I mute it, if the developer loves it. They're really good escape games, with a distinctive, memorable feel and style. Nice one... some interesting puzzles, although the four color circles was a bit awkward. simplynigel, if you hit the "Game menu" button below the inventory, you can turn off the background music. Got stuck on the xylophone. I had the clue and hit the proper bars with no luck, checked the walkthrough and confirmed that's what I had to do then went back and it opened before I even finished hitting all the bars. At least there wasn't a colour puzzle where the colours don't really match up with the clue this time. Fun one. And ha, agree that I have to mute the music in tomatea games.